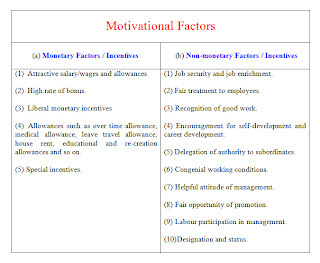 Just wanted to share with you my opinion on how important the motivational factors are @work place. Motivational factors plays significant role in keeping up the spirits of an employee and you know, that a motivated employee is one of the key factors for a break-through in the business. I’m not happy with my current occupation though I am contended with my work and pay. * Team Outings: Company Sponsorship or Team’s Contribution – helps in filling the gaps among the team members, if any. * Rewards & Recognition: May be once in a Quarter – highlighting the special achievements of an individual/ team towards making the business effective. * Birthday Goodies: By the Company – Can be Anything, not crossing the budget constraints. * Work Satisfaction: Reduce the Idle Time – utilize the resource(s) in all possible ways when the employee comes forward, keep them busy. * On-time Pay: Salary, Appraisals – No one likes to wait for long to get their payments. * Complements: Emails complementing an individual’s or team’s efforts. * Surveys: Also, there should be some way to take each employee’s opinion on how they feel in his/ her current role in terms of their satisfaction levels, in the form of Surveys (of course anonymously as an option) which helps management to take any necessary action(s). There will be many other ways to keep an employee motivated and not limited to the above specified. It all depends on the Company’s culture and the retension policies which are in place. In my opinion, a company which doesn’t work on retaining it’s employees will have high attrition rate and may not attract new people to be part of it’s family. Any thoughts? More motivational factors that you feel are important as well? Your inputs are welcome and will be highly appreciable. Prev Does ‘Professionalism’ Means ‘Tying-A-Tie’? Next Escalation: Why, When & How?